Dhaka, 12 Mar, Abnews: The fire, that broke out at a slum in Dhaka's Mirpur area early Monday, has been doused. A total of 23 fire units brought the blaze under control around 7:30am. Fire Service duty officer Mahfuzur Rahman confirmed the matter to risingbd.com. "On information, 14 fire units rushed to the spot to bring the blaze under control. Later, nine more fire units joined the team," he said. 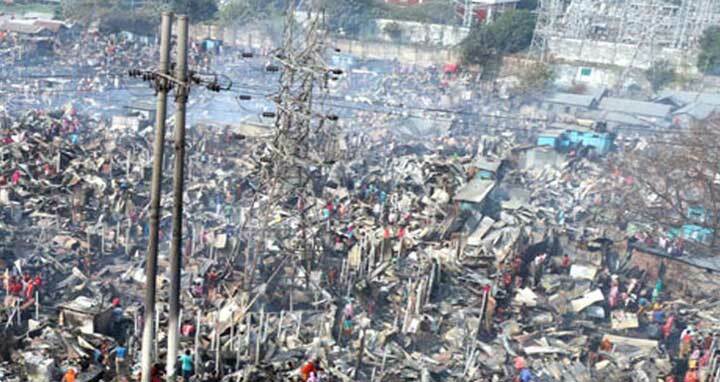 Earlier, several hundred shanties were gutted in a devastating fire that broke out Ilias Mollah Slum in Mirpur-12 of Dhaka on Monday morning.